On Being With Others is an outstanding exploration of this key philosophical question. Simon Glendinning shows how traditional positions in the philosophy of mind can do little to rebuff the accusation that in fact we have little claim to have knowledge of minds other than our own. On Being With Others sets out to refute this charge and disentangle many of the confusions in contemporary philosophy of mind and language that have led to such scepticism. Simon Glendinning explores why early attempts by J.L. Austin and Martin Heidegger to refute scepticism about other minds failed and argues that we must turn to Wittgenstein in order to build a solid theory of other minds. 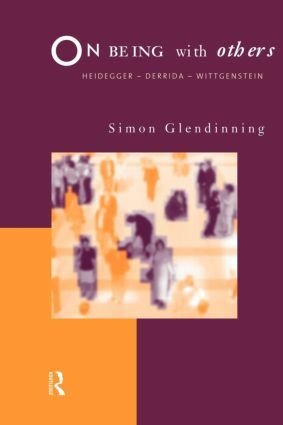 Drawing on the celebrated debate between John Searle and Jacques Derrida, Simon Glendinning establishes fascinating and important links between controversies in the philosophy of mind, language and epistemology.